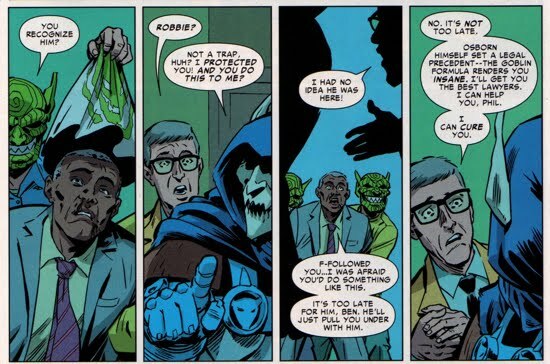 Norman's ability to evade the authorities and keep the public unaware of his secret life as the Green Goblin came to a sudden halt at the conclusion of The Pulse #5. He would eventually face trial and be sent to prison for his crimes committed. For the record, the exact crimes Norman would be charged with have never been officially stated. As one might expect, the prison cell walls of Riker's Island Penitentiary were not going to be enough to stop Norman's tormenting of Peter. 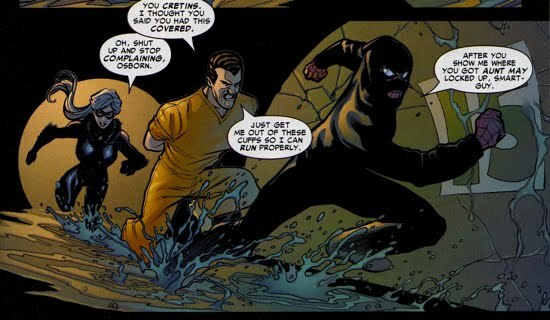 In fact, Osborn being placed into jail actually triggered one of his numerous contingency plots and this one involved the wall crawler! Marvel Knights Spider-Man #1 continues from and supplements the capture of the Green Goblin that was featured in The Pulse #5. 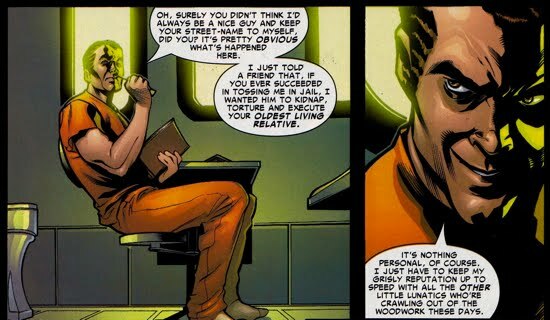 Although it occurred off-panel, Norman escaped custody once again at some point after his arrest in The Pulse #5 as reported in the All-New Official Handbook of the Marvel Universe A-Z Update #1. Osborn made his way to a church and took 18 people hostage threatening to gas them if his demands were not met. Norman's demand? Not money, not an escape vehicle, he simply requested that Spider-Man commit suicide publicly. Peter did not comply. Despite Norman's desperate attempt at freedom, Spidey once again subdues his long time foe and Osborn is sent to Riker's Island. Of course, Norman is counter-suing Spider-Man for aggravated assault. Shortly after, Peter receives a phone call informing him that his Uncle Ben's grave had been vandalized. Peter goes to inspect the grave, but while he's there he receives a phone call from a mysterious individual who claims to know that he is Spider-Man. Peter rushes home to find his house ransacked and Aunt May missing. 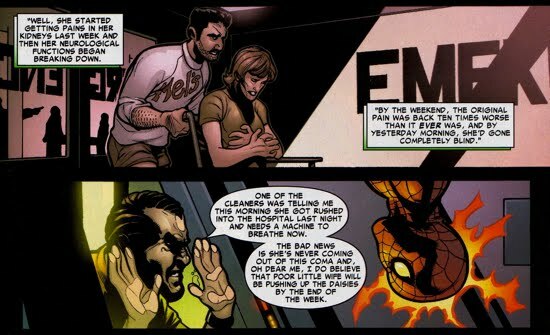 Not wanting to risk the health or safety of his wife, Peter asks MJ to leave NYC until this situation has been handled at the onset of Marvel Knights Spider-Man #2. Peter, as Spider-Man, then heads to Riker's Island to confront Norman Osborn, Peter's number one suspect for the recent vandalism. The two converse through the glass wall of Norman's cell (very Silence of the Lambs-esque) and Norman begins to play mind games with Peter. At first Norman denies any involvement in the kidnapping, but then, to toy with his nemesis, he informs Peter that he may have shared their "little secret" with a mutual acquaintance. Osborn goes on to say that he told "a friend" that if Peter ever succeeded in landing him in jail then this "friend" will kidnap, torture, and execute Peter's oldest living relative. As if that wasn't enough, Norman explains that he may just be taking advantage of the vulnerable Parker and that none of that information may be true. A frustrated Peter Parker leaves Riker's Island. Spider-Man then begins tracking down every possible lead he can find to locate his missing aunt, but all of his efforts are fruitless. The Owl using Spider-Man to his advantage and sends him after Electro and Vulture, claiming them to be responsible for the kidnapping. But, as it turns out, Electro and Vulture had nothing to do with that crime and The Owl had sent Spidey after them to settle his own personal score with the duo. In Marvel Knights Spider-Man #6, Peter returns once again to Norman's jail cell in an attempt to solicit aid from the villain. Norman then proceeds to tell Spider-Man about the last person to seek help from him and the tragedy that ensued from that. According to Osborn, one of the security guards had befriended him in an attempt to have Norman, a renowned biochemist, diagnose the strange sickness his wife was suffering from. Norman obliges the security guard and even provides a glimmer of hope as she appears to recover after using Norman's suggestions. But that relief was short lived, because the security guards wife has now slipped into a coma and will soon die. 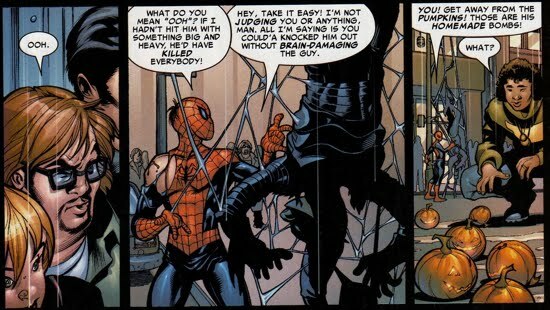 Norman then tells Spidey to, "ask [him] again for this favor you wanted…", in other words, be careful what you wish for. The plot thickens as Norman alludes to the fact that he is not safe in this prison cell and that the recent burglaries of his (Osborn's) offices are all part of a bigger picture. 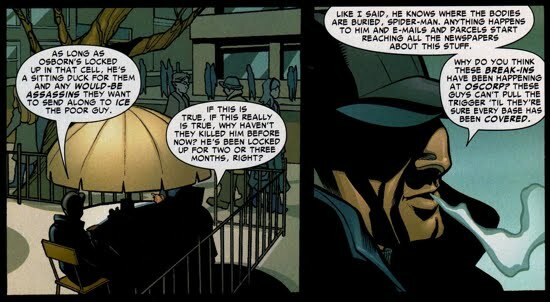 The conspiracy that Norman was referring to is fleshed out further in Marvel Knights Spider-Man #9, when Peter confronts the person behind the mysterious phone calls, Mac Gargan. When Gargan and Peter meet, Peter immediately attacks Gargan but the villain claims that Aunt May is still alive. Peter eventually settles down and decides to hear Gargan out. He claims to be the one responsible for kidnapping his Aunt May, and he says that he was working for Norman Osborn, but that this kidnapping is the “tip of the iceberg” for Norman’s plans. Gargan goes on to tell Peter the history of super villains. He claims that they were created in the forties when the ruling class (rich businessmen/companies responsible for putting governments into office) desired to keep emerging super heroes at bay, and away from discovering the corruptness which this "ruling class" has been utilizing to prevail. This “divide and conquer” tactic led to contracted super villains, of which Norman Osborn was one of the favorites, until he went out of control with the Goblin persona. Another facet to this "divide and conquer" strategy is that there is supposedly one or two villain organizers assigned to every hero. This explains why so many villains kept pestering the same heroes and why no one important was ever killed. This corrupt administration is no longer operating but there were some famous names in the “original cabal". Due to that Norman has become a target because he knows where “all the bodies are buried” and he is a sitting duck in prison. Norman Osborn orchestrated the kidnapping of Aunt May in order to solicit Peter’s help to break him out of prison, he has to help him or Aunt May dies. Gargan decided to share one more tidbit with Peter in order to coerce him into working for them. His quote, "Those old businessmen might not be making super-villains anymore, but Norman's still committed and he's been revamping all your major enemies for months." The guilt of losing another family member drove Peter to reluctantly aid Osborn's break-out. At this point Norman Osborn had been in jail for two to three months, there's a good chance that aspects of his trial were underway. Details surrounding the actual charges that Norman faced have always been sketchy, we know also during his tenure with the Thunderbolts and Avengers that much of his criminal past was exonerated. However, an interesting aspect of Norman's legal history was mentioned by Ben Urich in Superior Spider-Man Annual #2. Apparently Norman used the insanity plea at some point as a defense, there's a good chance that happened here. Spider-Man and the Black Cat work together to break Norman out of prison in Marvel Knights Spider-Man #10. The duo were short on time to because, unbeknownst to them, the security guard Scotty was coming to Norman's prison cell to kill him. Scotty was the prison guard who's wife, Barbara, was killed upon Norman's cynical medical advice (see Marvel Knights Spider-Man #6). Scotty did not get to exact his revenge because by the time he reached Norman's cell, Norman was gone. As Norman, the Black Cat and Spidey dashed through the underground prison tunnels, they were stopped by a maintenance worker who reported their escape. Osborn attacked the worker, nearly killing him, as he took off and continued on his escape. Thus the three were separated and Spider-Man was able to evade the guards through an exit that leads into the East River. When Spidey reached the surface, he was greeted by some familiar faces, eleven to be exact (because Gargan was late), of his rogues gallery. Norman gave the group of villains the name the Sinister Twelve and appointed himself their leader. For completeness sake, the Sinister Twelve included: The Lizard, Hydro-Man, Vulture, Electro, Sandman, Boomerang, Shocker, Tombstone, Hammerhead, The Chameleon, Scorpion (Gargan/Venom), and of course the Green Goblin. Gargan, now bonded with the Venom symbiote making him next 'Venom', joined the other villains to complete the Sinister Twelve in Marvel Knights Spider-Man #11. The mere sight of Gargan as Venom and not the Scorpion, as the Green Goblin had planned, was enough to cause Norman to lose focus for a brief moment but he quickly returned his sights to Parker. Fortunately for Peter, MJ called the Avengers, Daredevil, and the Fantastic Four who were able to help Peter to take down the Sinister Twelve. Unfortunately for MJ, she was snared from her home by the Green Goblin. Meanwhile Doctor Octopus, who had run rampant in the streets of New York whilst being under some kind of mind control back in Marvel Knights Spider-Man #5, awoke from a comatose state after hearing the word 'Osborn'. 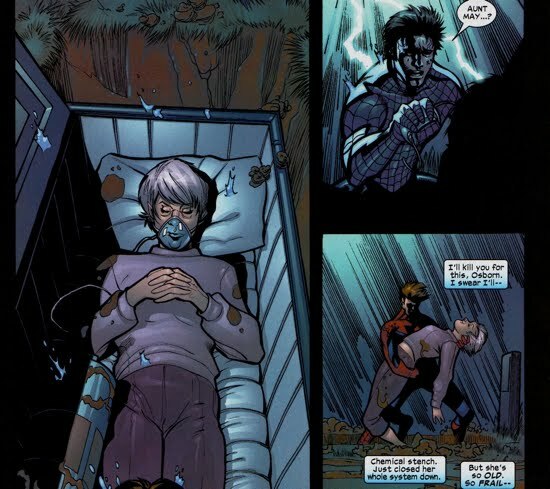 Ock had been programmed by the people who wanted Norman dead, and they planned to use Octavius to kill Osborn. Doc Ock escaped custody in Riker's and went out looking for Norman. Eventually Spider-Man reached the Green Goblin only to find that the villain had MJ dangling above the George Washington Bridge! 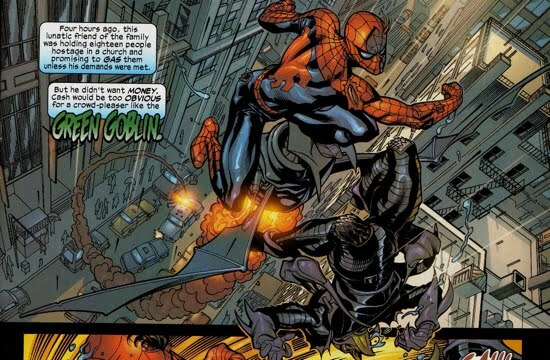 The Green Goblin proceeded to taunt Spidey atop the George Washington Bridge in Marvel Knights Spider-Man #12. Osborn decided to go to a different bridge than the one he chose for Gwen (he actually says so specifically). Luckily, the mind-controlled Doctor Octopus arrived and knocked MJ loose from the Goblin's grip. The Goblin quickly deterred Otto, who was not fit to fight, with a handful of pumpkin bombs and then resumed his attack on Spider-Man. 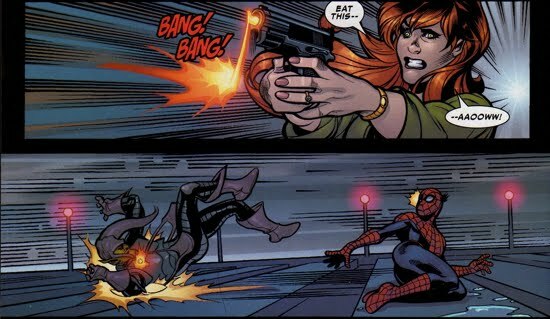 MJ, armed with a handgun, fired at the Goblin freeing Spidey in the process. However, the recourse from the gunshot sent her off the edge of the bridge as she nearly plummeted to her death. 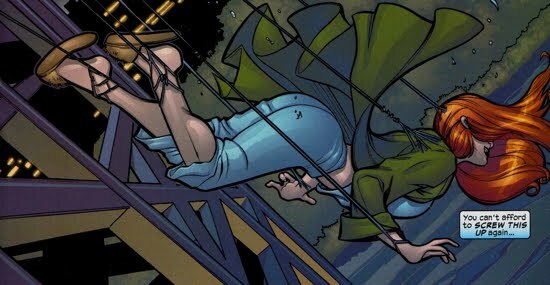 Spider-Man, aware of the fate of Gwen Stacy, shot multiple web-lines down to save MJ, as to not snap her neck in the process. 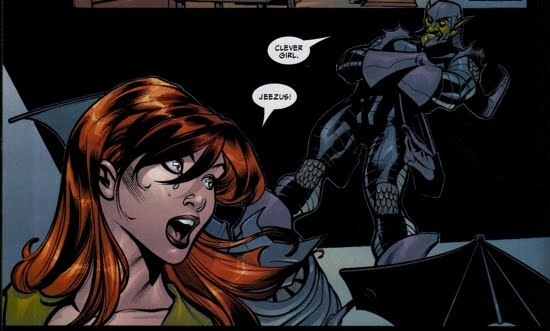 As Peter rushed to MJ's side, the Goblin attempted to smash the vulnerable couple with his Goblin Glider. 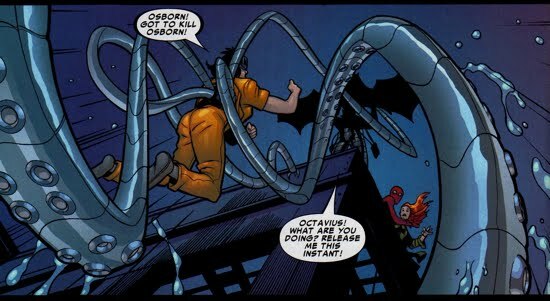 However, Octavius resurfaced and once again distracted Osborn. 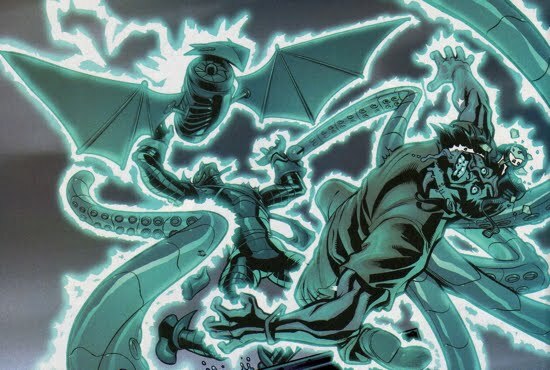 As the Green Goblin and Doc Ock battled, a lightning bolt struck the glider sending both Norman and Otto crashing into the water below. With the two villains out of the picture, Peter ruminated over the various comments uttered by Norman regarding his aunt's fate. Peter soon deduced Aunt May's location...Uncle Ben's grave! He reached the grave site just in time to save her life. The story concluded with a letter written from Norman to Peter thanking him for providing the intellectual and physical challenge as Spider-Man. Norman stated that those challenges have provided his life with both structure and meaning. This is certainly not the last we'll see of the Green Goblin as the villain disappears once again into the shadows. Some interesting tidbits from this story include the age of Norman Osborn. According to Peter Parker, Norman is 55 years old at the time of this story (for more of the implications from this, see Osborn Timeline). 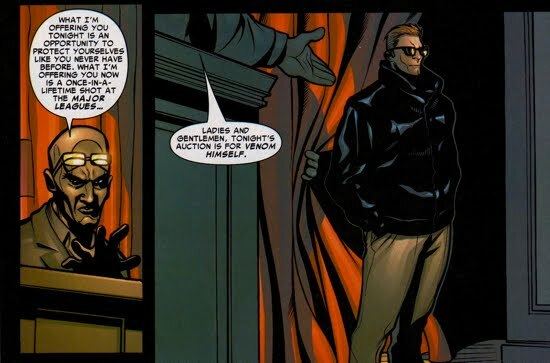 Also, in the Venomous story arc (Marvel Knights Spider-Man #5-8), Eddie Brock sold the Symbiote to the highest bidder. But when that bidder doesn't satisfy the symbiote it finds a new host, Mac Gargan. This event will influence Osborn's life once he becomes the director of the Thunderbolts (and later the Avengers) and Gargan/Venom becomes a team member. 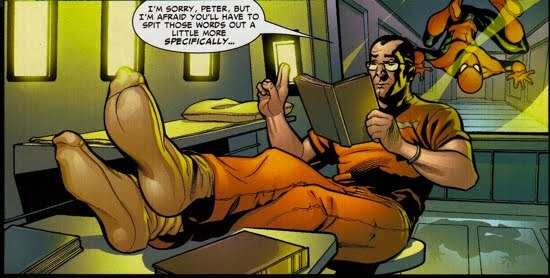 Finally, Peter stated in Marvel Knights Spider-Man #9 that Norman has spent 2-3 months in jail, so he's certainly seen a trial, it is still unclear though as to what crimes he was charged with during his trial. Additionally, although it is never explicitly shown on-panel, the All-New Official Handbook of the Marvel Universe A-Z Update #1 lists Norman Osborn as having been picked up by S.H.I.E.L.D. agents somewhere in France after this series of events. Pity this wasn't ever seen in the pages of a comic book, it certainly would have been interesting to see that arrest. In the next chapter (Gwen's Children), Norman is depicted as 'operating from the shadows', most likely these 'shadows' are prison walls. After Norman's 'death' Norman operated clandestinely in Europe, that is most likely the reason he headed for France after his creation of the Sinister Twelve.